First it’s freezing cold, then it warms up – only to chill right back down again. As all too many of our clients have discovered, this wreaks havoc on your pipes, but you don’t even know it until the weather warms up and the ice that broke your pipe starts to melt…and flood your home. Fortunately, there are wonderful restoration companies out there, from small independent business like Renew Restoration and AMH Restoration, to the big guys like Restoration 1, DKI Restoration, ServPro, Paul Davis Restoration, PuroClean, and NY Fire Water Mold just to mention a few, that get you cleaned up and back to normal. And that’s where portable storage containers come in: keeping your household items safe while the work is done. We’re happy to share this article adapted from our friends at moving.com that tells the many ways portable storage containers can help you through a disaster – and so much more. Enjoy! Weather-related catastrophes were once relatively rare events, but these days local newscasts report a story almost nightly about some unfortunate family, neighborhood or city that’s suffered a tragic event caused by wild weather. Homes damaged by falling trees, neighborhoods evacuated because of wild fires, tornadoes ripping through towns, homes submerged after endless days of rain and other terrible events are becoming more and more common and because of these emergencies, a great number of people are often faced with recovering from a disaster. And one of their prime concerns when trying to recover from one of these devastating events is figuring out what to do with their salvageable belongings. This is one area where moving containers have become an invaluable solution. In recent years, portable storage containers have expanded beyond their originally-intended use of helping people relocate. These secure storage containers are now often used before and after large-scale disaster situations to keep homeowners’ belongings safe by providing them with the storage space they need to salvage their lives. Meanwhile, moving containers have also been used by government agencies to help deliver food and supplies to regions hit by disaster. Whether used as a makeshift health clinic or as a means to get fresh food and water to a devastated city, these portable storage containers offer a durable and practical solution. Storage containers aren’t only used for large-scale disasters; they can also be a tremendous benefit to individuals, families and businesses suffering through an isolated incident. 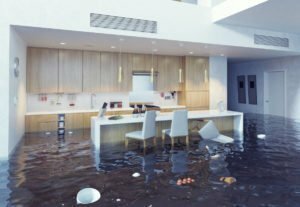 Such situations include recovering from a fire, flood damage or from a tree falling on the home or building. In these events, having a secure place to put your belongings is the key to protecting them from additional damage. 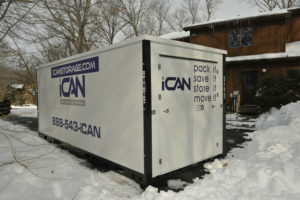 While these storage containers are certainly beneficial in emergency situations, in truth, there are many different scenarios where a homeowner may need the use of a portable storage unit besides helping them relocate. Common uses besides emergency relief and relocation include using the container to store furniture while the house is being fumigated against insects or rodents, using the storage container to help manage a divorce or simply using the container to store a room’s belongings while you renovate. 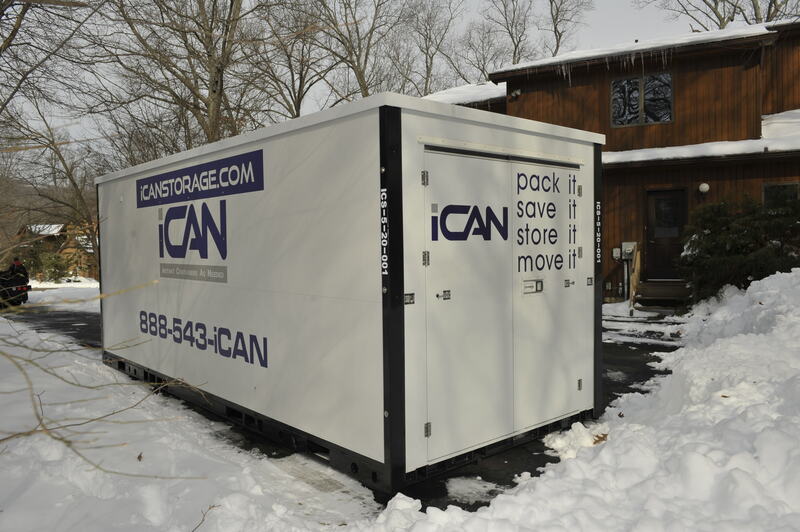 If you need a portable storage unit to help you manage a crisis in your life, simply contact iCan and arrange for us to drop off however many containers you are going to need. 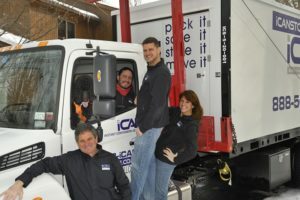 We will transport the moving containers directly to your home and place them wherever you instruct us to. Fill up the containers with your belongings and they’ll be safe and secure for as long as you need them to be. Once intended solely for relocation purposes, portable storage containers have now become an all-important life-saving and life-salvaging resource for helping people and communities recover from various natural and non-natural disasters. Of course, these containers still offer one of your best options for moving your belongings, so even if you’re not faced with recovering from a tragic event, you can still enjoy the benefits of these convenient containers when it comes time for you to relocate.